Crumbling Mine is a small mine southeast of Chorrol containing bandits. It contains only one zone, Crumbling Mine. At the end of the mine, you can see what appears to be an attempt to tunnel into Chorrol's sewer system, but there is no way of actually entering the sewers. You can see parts of the foundations of Chorrol's city wall in some areas. 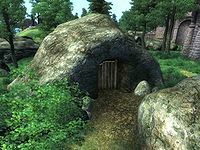 The exterior is located at coordinates: Tamriel -15, 22. This location's map marker (M on map) is named Crumbling Mine (editor name CrumblingMineMapMarker). The entrance door is north of the marker, 60 feet away. The following plants can be found near the entrance: 8 Fly Amanita plants, 5 Steel-Blue Entoloma plants, and 3 Strawberry bushes. This is a relatively small mine and contains loads of traps. Upon entering from door Out, you will encounter an enemy guarding a chest in the very first room. Advancing further leads you to another room with a Bandit and a swinging mace trap at E. From this room, two paths can be taken. Taking the path to the right will lead you past one bandit, one minor loot chest and two bedrolls (b), before ending up in a large room. The second path only holds one minor loot chest, before it ends up in the aforementioned large room. This room has two enemies in close proximity. It will be difficult to get rid of them one at a time. This room also holds a dining table, two bottles of cheap wine and various cutlery. There is a slaughtered deer in a dark nook as well, probably serving as food. Going deeper into this mine leads you past a room on the right, which collapses as you approach it due to a cave-in trap at C. Further on are two traps. First you have to watch out for another swinging mace trap at D, and secondly you will have to avoid the falling logs at F. This path eventually ends up in a bandit camp. This bandit camp consists of one regular bandit, a boss leveled Bandit at A, two tents with two bedrolls (b) and more cheap wine. 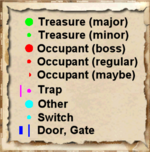 The boss-level chest is also located here (B). At the end of the camp, you can see Chorrol's sewer system through a hole in the wall. The bandits are trying to get into Chorrol, judging from the various tools scattered around, such as pickaxes and shovels. It is impossible to get into the sewers, however.